More snarky material here on democracy as practiced in Taiwan. This one is truly pathetic. Try convincing mainland China that this kind of democracy is the best way to go! Why do these things happen? Politicians get elected in Taiwan by winning popularity contests, and that requires high name recognition. Therefore, they are compulsively addicted to find ways of staying in the media limelight. They will make a sensationalistic charge and accuse the government of sins of commission and omission, and they will take some shortcuts (and even big cuts) to make the charge stick while anticipating no repercussions if the charge should be proven false. This present case is an example of the worst of the worst. In the end, there will be those who say that the system worked because the truth came out. But the system certainly did not work for those restaurants whose business suffered due to the unsubstantiated blanket charge. While some of the media did raise doubts about the story, most of them gladly took the story and ran with it to the full tilt. The main culprit here was also simultaneously a Taipei city councilor and a television program host, which was the combination of the worst with the worst. June 2, 2005: People First Party Councilor Wang Yu-cheng went public with a video-tape of a man in black (whom Wang characterized as a "Funeral Food Offering Cockroach" (腳尾飯蟑螂)) taking funeral parlor food offerings (chicken, pork, fish and rice) and selling them to local restaurants. The released videotape had two segments. The first segment shows a man in black picking up a bag of food from an alleged funeral parlor worker wearing a hat. The second segment shows that the man in black went into a restaurant, held a brief conversation with a restaurant owner, deposited the bag and walked out. June 3, 2005: At the City Council meeting, Wang asked mayor Taipei City Mayor Ma Ying-jeou if he was willing to consume the beancurd cubes made from funeral food offerings taken from Taipei First and Second Municipal Mortuary. Wang put on a great show accusing the city of negligence. When Ma begged: "Will you let me explain?" Wang said, "What do I want you to explain? It is all on video. What can you possibly explain?" Wang named eleven restaurants as being purchasers and re-sellers of funeral parlor offerings. Business at all the restaurants in the same neighborhood plunged as a result of the news. June 4, 2005: After an investigation, the Taipei City Department of Health found that several of the restaurants named by Wang were either out of business or non-existent at the time when Wang claimed the tape was made (in March 2005). Doubts begin to emerge from all sides. For example, it was cold in March this year, so why was everybody in the video in short sleeves? Furthermore, Wang claimed that the rice was taken to be made into beancurd cubes whereas the manufacturer said that rice is not (and cannot physically be) an ingredient. June 4, 2005: Wang declared that he has received threatening telephone calls ("if the investigation continues, your whole family will be dead") and filed a report at the police station. The press quoted Wang's six-year-old daughter asking, "Why do I have to go into hiding?" He says he will have to quit exposing evil in order to protect his daughter. Two of his aides have reportedly quit as a result of the threats, but those two will come back for a press conference three days later. June 6, 2005: Wang went to visit the markets and restaurants in the area to apologize to the owners whose businesses had been devastated as a result of the charges even though they had nothing to do with the allegations, but he insisted that the selling of funeral parlor offerings was happening. The police tracked down two persons who own the motorbike (note: the license number can be read from the videotape), but they had not seen it for some time. June 6, 2005: Mayor Ma Ying-jeou went to eat at the market to show that he was confident that the "dead persons' meal" is a rumor. June 7, 2005: Mayor Ma Ying-jeou demanded that Wang produce the master tape and other proof, because it might clarify some details (e.g. How did the cameraman in a car get to the restaurant before the man in black on the motorbike? What did the restaurant workers do with the bag of food? and so on). Wang said that he could not find the master tape because it was taken a while ago. June 7, 2005: The man in black was arrested by the police based upon a tip from someone who recognized him, and he promptly confessed. He admitted that he was a friend of an aide of Wang Yu-cheng, and play-acted the part upon request from that aide. The motorbike was provided by Wang's aide, who had it without the owner knowing. The funeral offerings exhibited were purchased from a food market, and not removed from a funeral parlor. The alleged funeral parlor worker was play-acted by one of Wang's aides wearing a hat. The man in black had gone into the restaurant, placed an order, left the bag temporarily to go across the street to buy a cup of tea, came back and picked up his order and the bag. Then he took the bag home, and ate the food. He said that the aide had promised him that the video footage would have the words "simulated footage" on it. June 7, 2005: After news of the arrest of the man in black appeared, Wang Yu-cheng and three aides held a press conference, in which they admitted that the video-tape was a simulated act recorded on May 28, 2005. As the aide explained what had happened, his story got stranger and stranger about the motorbike which had been reported as stolen by its previous owner. So the aide got down on his knees in front of the media and swore an oath that he was telling the truth: "I swear that everything I say is true. If I tell any lies today, may I be run over by a car!" Wang is the host of a television program on social issues on ETTV-S, and had been trying to investigate this type of case. On June 2, TVBS-NEWS reported on funeral parlor offerings. The ETTV-S people had a huge row with Wang, accusing him of feeding the information to the rival channel. So Wang ended up offering the video-tape of the man in black to ETTV-S.
Wang said that the aides did so without his knowledge, but he was willing to accept full responsibility. When asked why he did not see that the alleged funeral parlor worker wearing the hat was his aide, he claimed that the camera was too far away and the focus was fuzzy. Wang insisted that the re-selling of funeral parlor offerings exists and that the mayor should not lose focus on the real issue. 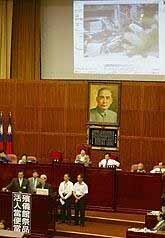 June 8, 2005: The People First Party suspended Wang Yu-cheng from the party indefinitely, and he wept: "Leaving the PFP is the severest punishment for me. I don't want to leave the PFP. I didn't do this deliberately. It was done out of good intentions." He won't quit as councilor, because "it would be a betrayal of the voters who supported me." Wang also had his television show cancelled by ETTV-S. But Wang Yu-cheng, his three aides and friend may in fact have no legal liabilities for putting on this show. The beleaguered restaurant owners may file civil suits, but it would be difficult to assess damages; the funeral parlors have sued Wang for 10 million NT dollars, but their civil lawsuit is equally uncertain. And it is unclear what municipal legal statutes (if any) had been violated.